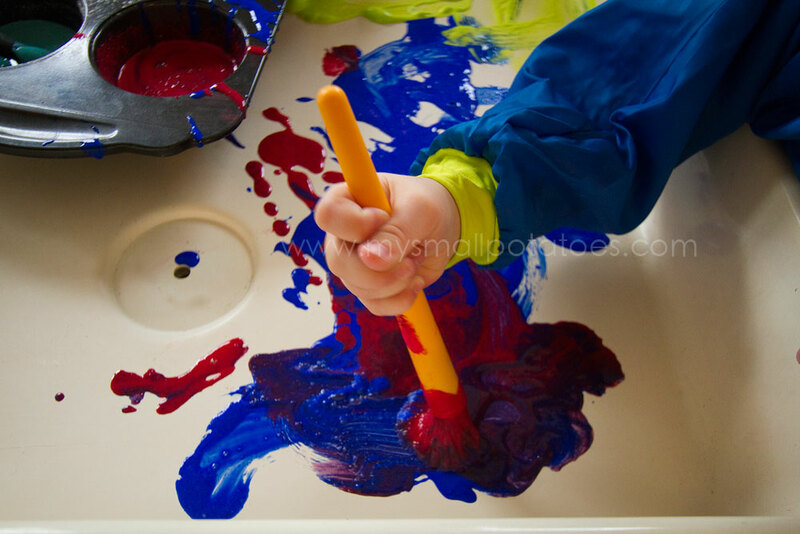 Remember yesterday when the baby was painting in his own sensory bin? 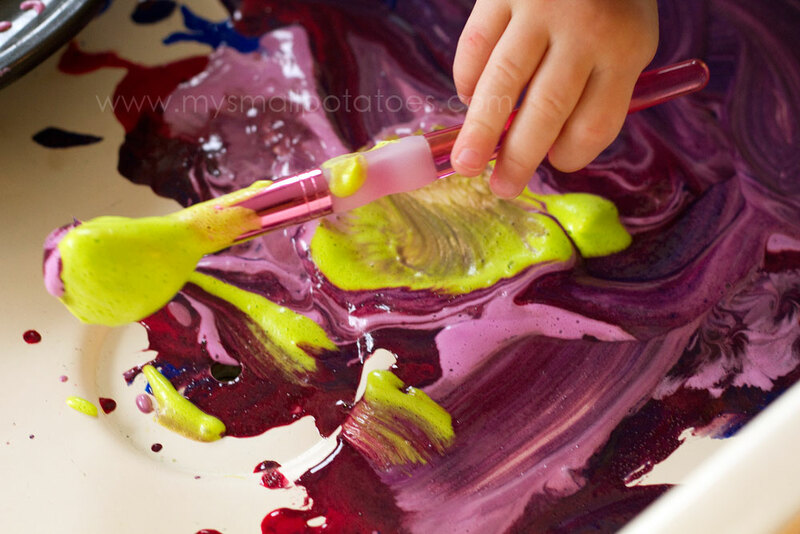 Well, the toddlers were painting in their own sensory bin too…everybody plays, right? But their bin was bigger and had a little bit more going on in it. 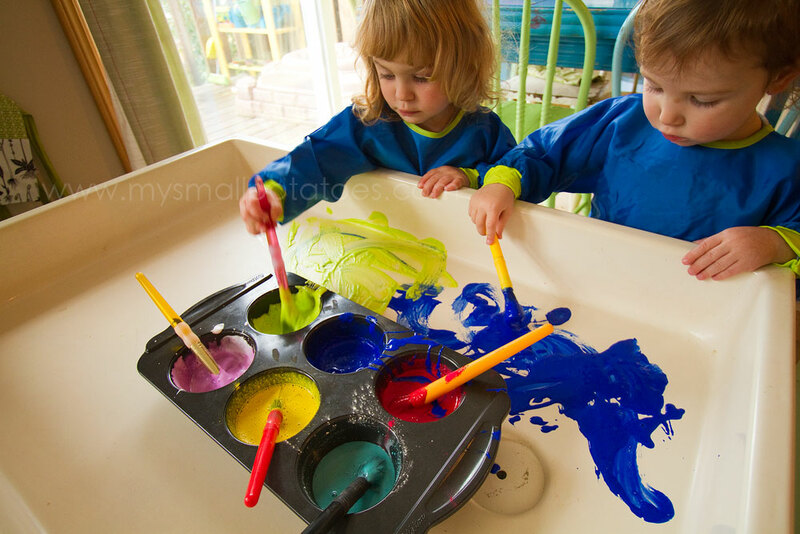 Both of these girls have passed the age of putting things in their mouths, which allowed me to give their painting sensory bin a turbo boost. I used 3 different kinds of paint. Each with a different texture and smell… The shaving cream paint is exactly that…shaving cream squirted into the muffin pan with a few drops of food colouring mixed in… It’s very fluffy and bright and smells very fragrant. And it so simple to make. The baby shampoo paint is also very simple. 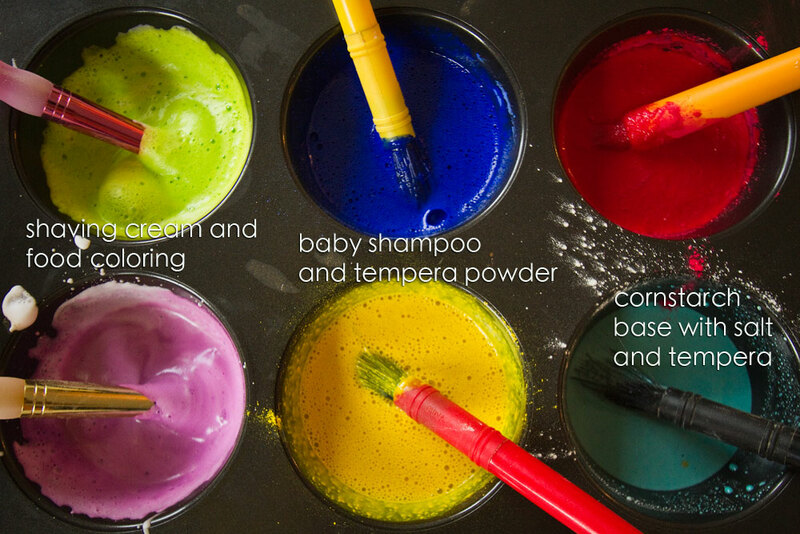 Pour baby shampoo into your muffin tin, add a teaspoon of powdered tempera paint and mix! It’s very smooth and “painty” and smells yummy. You can use different kid shampoos that give you a fruity smell, or just plain old baby shampoo. It’s up to you. The cornstarch paint is just equal amounts of cornstarch and water mixed together in the muffin tin. I added a couple teaspoons of salt for “grit” and a teaspoon of powdered tempera. This paint was very gritty and did not leave big juicy trails of paint behind. The grit ploughs through the paint and leaves only a hint of coloured salt in its path. The salt did really neat things to the soapy paint…it left little tiny craters, almost like mini sinkholes! I chose not to use paper in this activity because I didn’t want the girls to be limited by “fences” and soggy paper. There is nothing more frustrating than a big ol’ hole in your paper after you’ve worked so hard on your masterpiece. 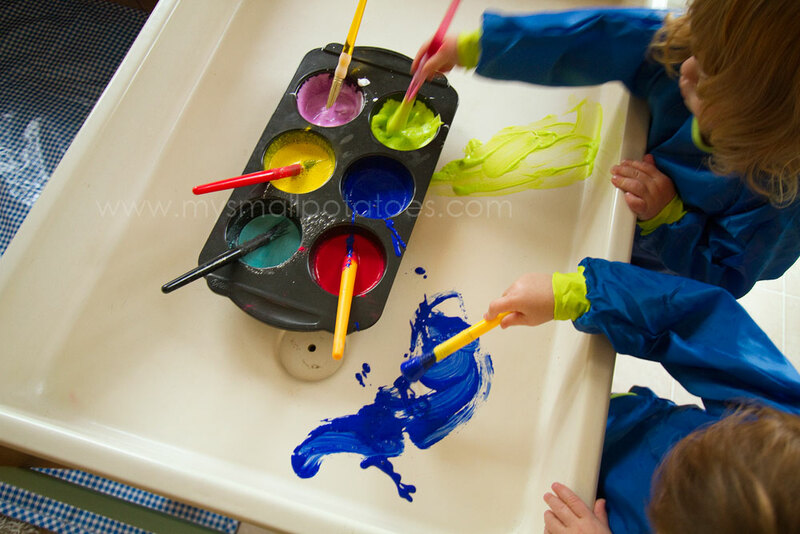 Even if you don’t have a fancy water table like this, you can still do this activity with no paper. 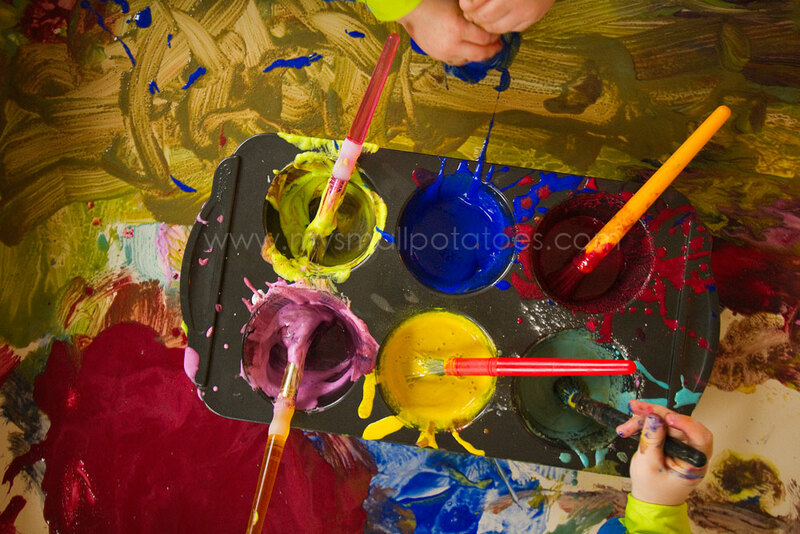 Before I had this table (which I purchased through a teacher’s store catalog, btw), we used to paint right on our art table. 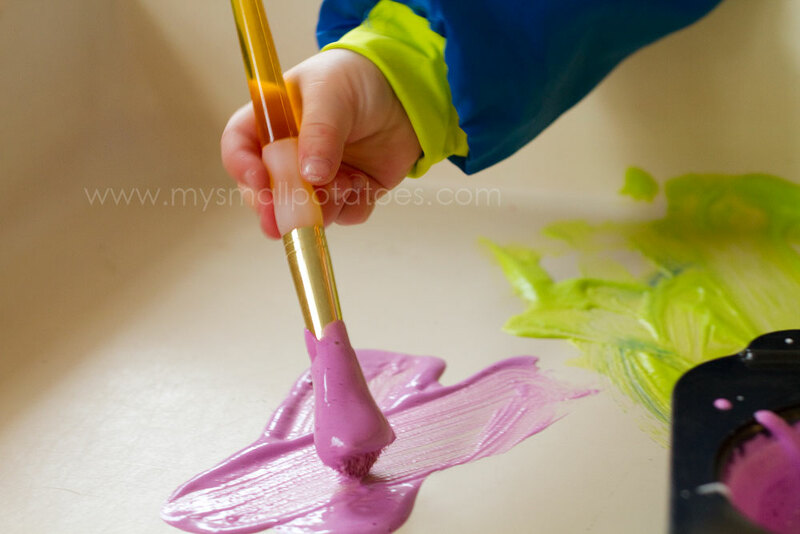 If this is still too scary for you, give each child their own plastic tub to paint in…just like I did with the baby yesterday. Two 2 yr olds playing side by side without a fuss for a good half an hour. That’s bliss. There is so much opportunity for speech and vocabulary practice in this one activity. 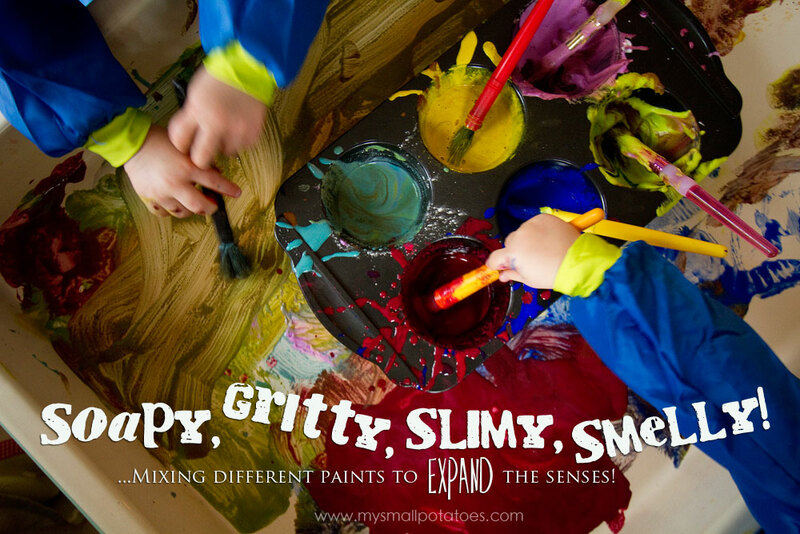 We chose different words to describe the way the paints felt, smelled, and looked. 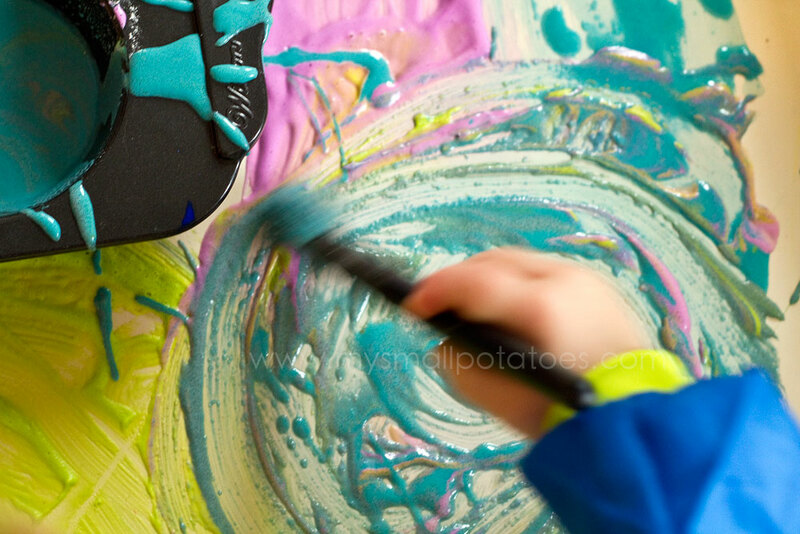 We made sound effects for our brushes as they “smooshed” their way through each paint. 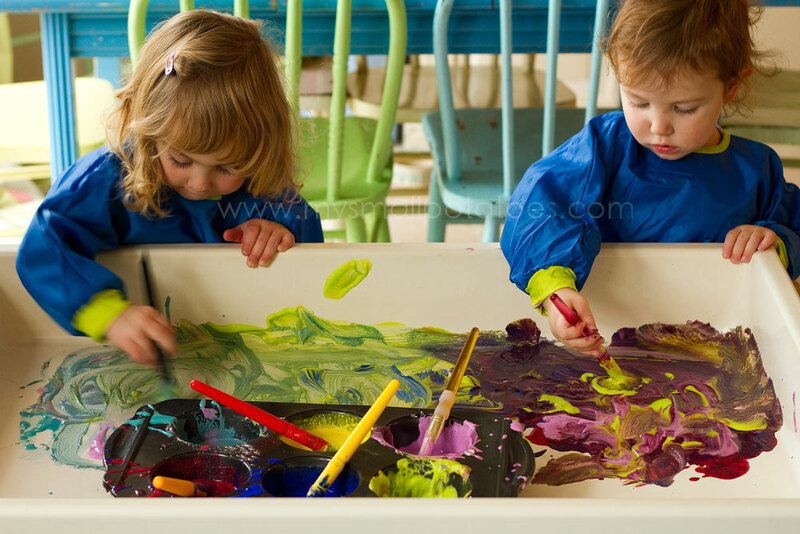 Even turn-taking gets practiced as each child wants to experience each type and colour of paint. And visually? Well, this activity is just plain pretty. It’s a smorgasbord for the eyes. 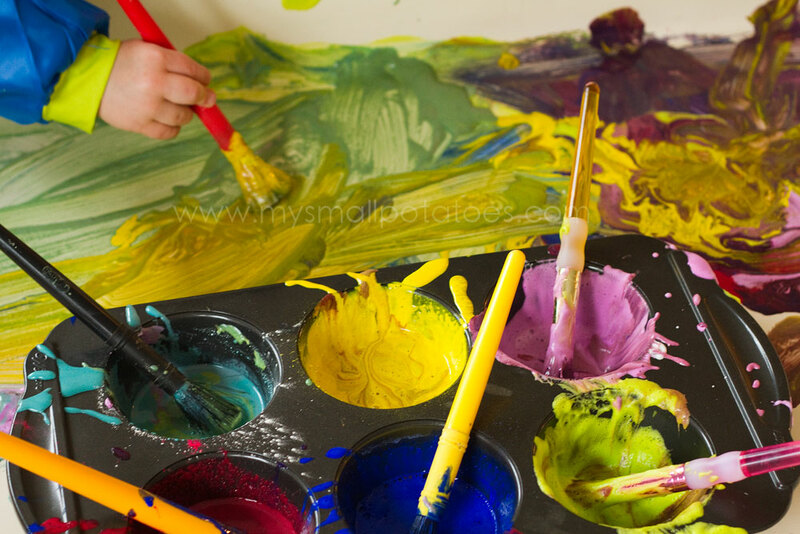 Look at it from a 2 yr old’s point of view and tell me you don’t want to get in there and paint, too! Pretty, isn’t it? 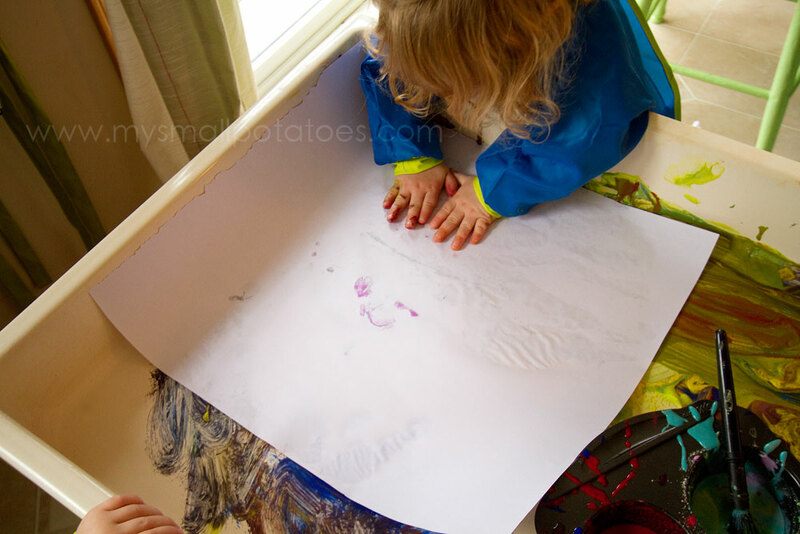 When the girls were finished painting, I gave them the opportunity to make a print of their work to take home with them… But the fun didn’t stop there! 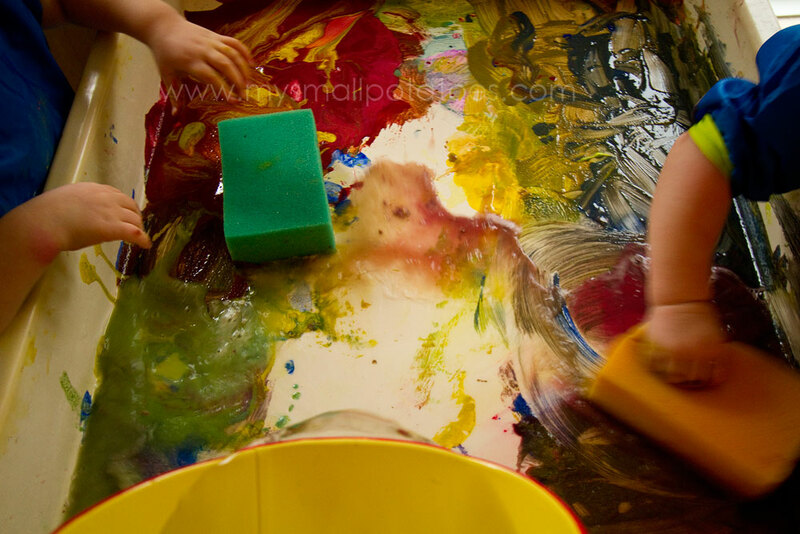 We continued in the sensory experiment by adding a bucket of water and a couple of sponges… The girls swirled the water and paint around, and didn’t even realize they were helping with clean-up! They just figured they were playing! 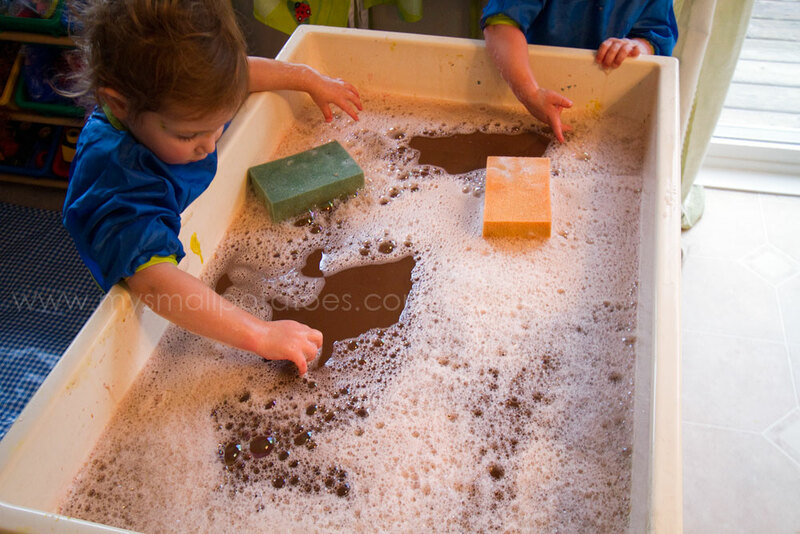 The baby shampoo paint bubbled up as the girls played, and soon they had a bubble lake on which to float their sponges. In the end, I pulled the plug and emptied the murky water, wiped out the table and we were ready to move on to our next adventure! Love this, perhaps we’ll have a go tomorrow! Love the way you roll…. 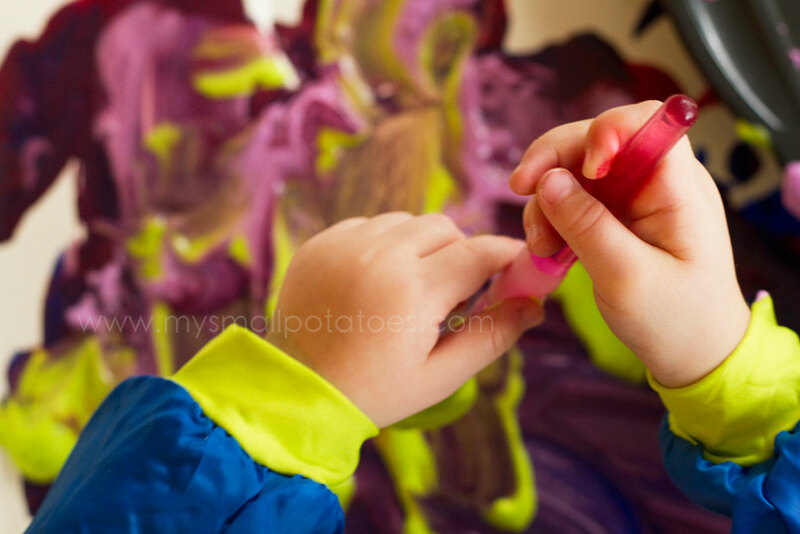 be looking forward to lots more ideas to make my days with my family day care kids curiouser and curiouser….. Very cool!! Is the bin connected to a drain somehow?